At the end of the FES sessions at school there is a closing event, this time it was Greek Marketplace. The assignment: each family needed to make something to trade with other families in a market fashion. Our family made Pasteli (sesame seed and honey candy) only with our high humidity it was more like honey goop with sesame seeds. The boys had fun trading the candy for other family’s goods, but it didn’t stop there. Jonah traded a family for a well painted rock of Larry the Cucumber – highly sought after item, so one of his friends arrived in the afternoon asking to trade a bracelet, small rock painted with the work Dad and a top for his Larry the Cucumber rock. Jonah took the trade because 3 items are better than 1. Oh to be a six year old! 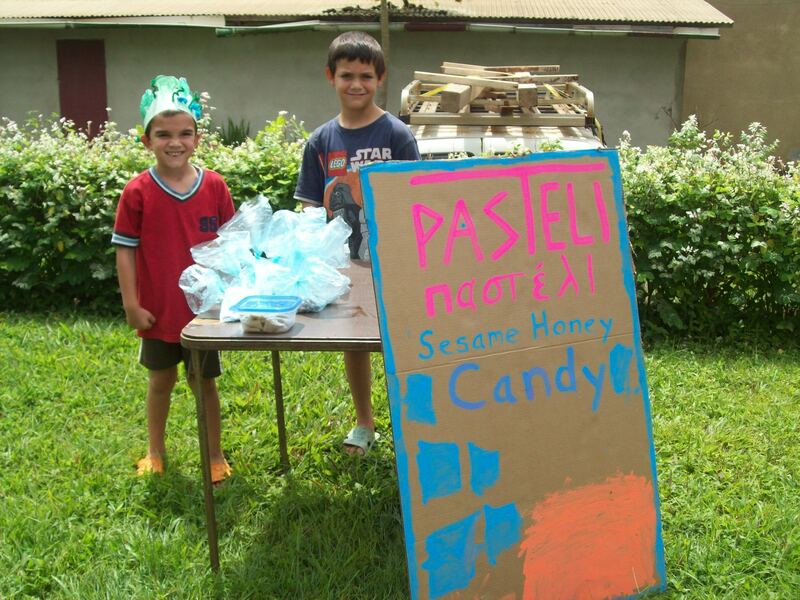 This entry was posted in Cameroon, Kids and tagged Cameroon, FES, Pasteli, School, Sesame Honey Candy. Bookmark the permalink. Jonah – great trade. Hope you both enjoy school.